Ruby Let Me Take a Photo! I know, I know – somewhat of a disappointment… but I should be grateful she let me take a picture at all. Tonight being Sunday, I popped over for dinner with Ruby around 5:30. It was her turn to cook, and she was a running “a little behind the times”, as she puts it. Her back bothers her a lot more lately, and being on her feet at the stove must really be hard on her – so I was slightly dismayed to realize she was making a perogi dinner for us. She had to be on her feet the entire time it was cooking, and she wouldn’t let me help. “If I sit down now, I might never get up again,” she said, shooing me back to the table. 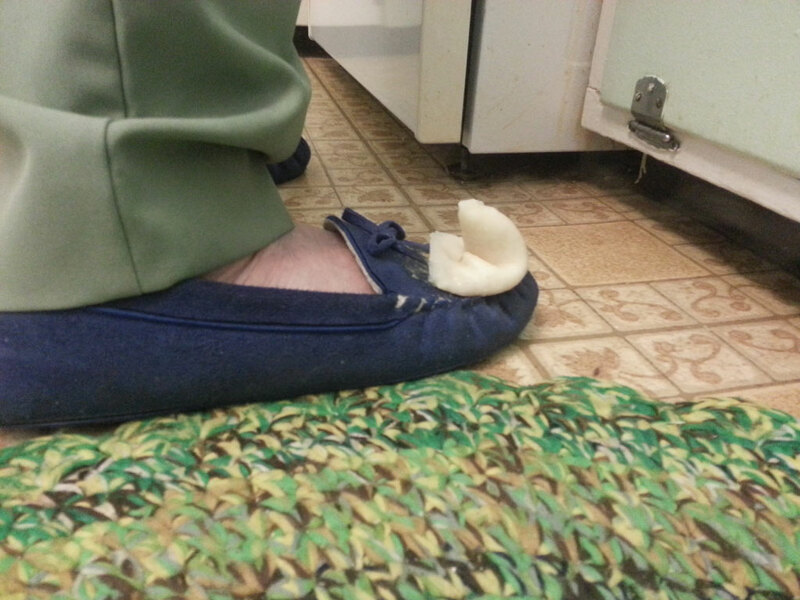 When she flipped a perogi out of the pan and it landed on her slipper, she got laughing and let me snap the picture, telling me, “Don’t worry; we won’t eat that one…” , but she got a little impatient with me when I wouldn’t let her bend over to clean her slipper up (she’s also been hit with a few bouts of dizziness over the past year). Ruby is determined not to “be a burden”. I argue and argue that letting me do the odd bit of housework does not constitute her being a burden – especially when her back is bad. Now and again, she’ll “allow” me to make up her bed, which is especially hard on her, but most times she tells me to leave it alone. Lately, her “Shower Lady” has been making her bed when she come over. She doesn’t ask – she just does it, and so Ruby lets her. I tried that once with the dishes, and although she didn’t say it in so many words, I think Ruby was put out with me, so I haven’t had the nerve to do so again. I am allowed to bring her laundry up and down the basement stairs, and sometimes she even lets me throw it in the washer, or fold the stuff as it comes out of the dryer, but not on a regular basis. Her reasoning is that if she doesn’t at least attempt to do her own housework, she’ll likely wake up some morning and be all seized up, like the Tin Man in The Wizard of Oz. She may have a point – really, who am I to say, non-expert that I am? But I worry… and she scoffs at me. Then she laughs at me. She’ll be 89 this month. I should shut up. We should all be so lucky to be in her shape when we’re 89.